A pug mill is an easy way to reuse your clay scraps and turn any offcuts into lovely workable clay. Although a pug mill can be a bit of an investment, you can work out if it will be a worthwhile investment for you by looking at how much clay you will save by reusing it. Pug mills don’t just save you clay—and money—they’ll save you time and energy, as they eliminate the need for wedging and kneading. They are ideal if you have a bad back or weak wrists as they do all of the heavy-duty work for you. A pug mill works essentially in the same way a mincer might and it churns up and reforms the clay to a smooth consistency. Clay that has been through a pug mill is fantastic to work with. If you’ve decided to go for a pug mill, you’ll need to decide which model is best for your needs. There are a few different types that you’ll need to know about. In the most common pug mills, you just push your scraps of clay into the opening (it’s called a hopper) and it feeds through a metal cylinder, which has a large screw inside called an auger. The auger churns up the clay and works out any inconsistencies and lumps and bumps and packs it tightly together. The pug mill then feeds the clay out of the end into perfect long tubes and it’s ready to use straight away. If you go for a de-airing pug mill then you essentially take out all the air bubbles (using a vacuum) and making the clay as homogeneous (uniform in structure) and smooth as possible. You can also get non-deairing pugmills that ‘extrude the clay’ by forcing it through the auger and still pack it together but don’t de-air it. If you’re making such a big investment for your ceramics studio it can be advisable to go for a de-airing pug mill, as it will eliminate any wedging you have to do afterward. Many wheel throwers tend to prefer de-aired clay as it is that bit smoother, but there is a slight downside in that it can dry out your clay a little. If you don’t use your clay quickly then you might be better going for a regular pug mill (without the de-airer) so you won’t need to re-wedge the clay if it gets too dry. Is It Worth Investing in a Pug Mill? A pugmill is not the first piece of equipment you’ll invest in for your studio, but for professional ceramicists and schools, it can be a welcome addition. Your body will thank you for taking the pressure off having to wedge all your clay. As pug mills cost in the region of $2,000 upwards you’ll need to seriously work out how often you will use it. What Types of Clay Should You Use in a Pug Mill? Essentially you can put any type of clay through a pug mill, although it’s unlikely you’ll have enough porcelain left over to run through a pug mill, as it’s so expensive to buy, most potters wouldn’t have that much in scraps. 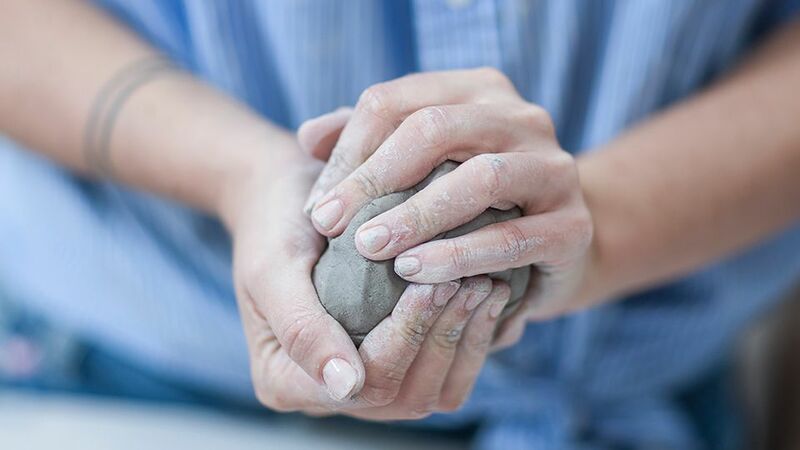 Stoneware or earthenware are the perfect clays to run through a pug mill. You’ll need to be aware that pug mills are quite tricky to clean, so if you’re making a transition from running a richly colored earthenware like terracotta through the pug mill to a white clay, it’s advisable to run some old scraps through the mill to clean out as much of the residue of the terracotta as you can, so it doesn’t contaminate your fresh new white clay. Of course, it is possible to reuse your clay without a pricey pug mill.